January 2018—Thanks to editor R.A. Villanueva for publishing my poem “Heavy (After Hieu Minh Nguyen)” over at Tongue. Gerard Manley Hopkins’s “Inversnaid,” a poem from which our course title is taken, relies upon sounds and cadence as much as concrete description to render his images of a river roaring into a waterfall. In this class for experienced poets, we will explore the ways in which poetic sound supports descriptions, reveals subtextual and emotional information, and produces the sensation of physical experience. We will consider our most sonic-driven contemporary poets, paying special attention to the ways in which sound is harnessed for dramatic effect. Although this class will touch upon meter and form, we will focus primarily upon cadence, the natural speech patterns that engulf our best free verse. Participants will complete generative writing exercises meant to strengthen their skills at cultivating dramatically appropriate sounds and cadences in their poems. This class will demand a deep engagement and vocalization of the poems we encounter, and we will ask as many questions about our experiences of poetic sound as we answer. To register by check instead of through Eventbrite, mail your check to Flatiron Writers Room, LLC, 5 Covington Street, Asheville, NC 28806 and include your email address. You will be registered when we receive your payment, space permitting. Class meets 2:30pm-5pm, Saturday, April 14th. 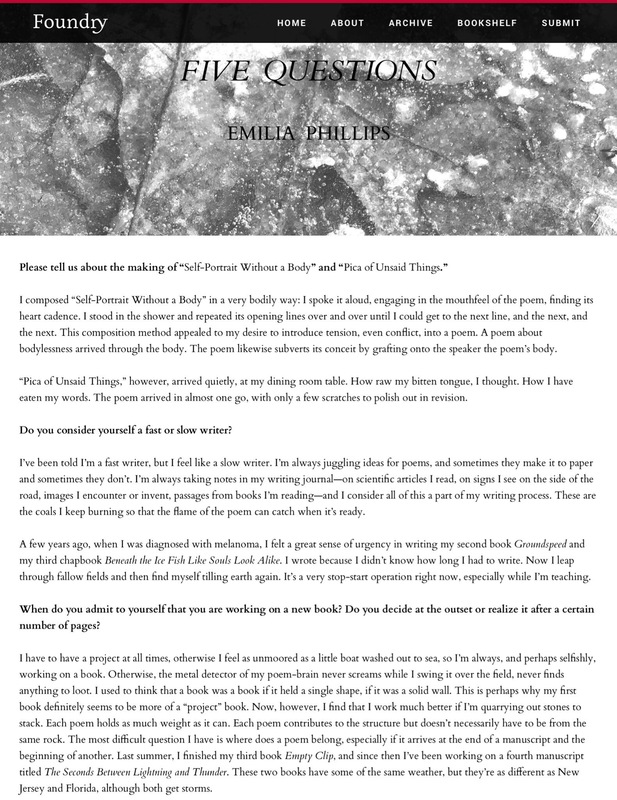 Following the class, at 5:30pm, Emilia Phillips will give a free public reading. January 2018—Thanks to the editors of Radar Poetry for publishing my poem “Butterfly-Shaped Organ.” Audio of me reading the poem is available as well. December 2017—Thanks to poet and AGNI poetry editor Sumita Chakraborty for recommending my forthcoming Empty Clip over on the AGNI newsletter. December 2017—Thanks to fiction writer Jamie Quatro for including me in a line up of poets she recommends over on Shelf Awareness. December 2017—In preparation for my eight-week, online poetry workshop, “I Am Trying To Be Marvelous: The Poetics of Body Positivity,” for the Fine Arts Work Center of Provincetown’s 24PearlStreet, I was interviewed over on the 24PearlStreet blog. December 2017—Thanks so much to Rosebud Ben-Oni for including my poem “Believe It Or Not I Started To Worry,” originally published in The Shallow Ends, in her recommended reading over on Glass Poetry. December 2017—Thanks to Janet Frishberg for inviting me to make a poetry playlist, “Poems of Body Positivity,” on Verse. December 2017—Thanks so much to Andrew Sargus Klein for recommending my Ploughshares essay “Generosity as a Social Justice Reading Practice” on Wildness. December 2017—Groundspeed, my second collection of poetry, was reviewed by Lynn Domina on KRO‘s December Micro-Reviews feature. Line after line, the poems in Emilia Phillips’s Groundspeed are interesting—to the intellect, yes, but also to the ear and the eye. Phillips takes advantage of the flexibility of the page, considering how lines can be placed spatially to affect rhythm as well as meaning. Her choices are thoughtful, whether lines are justified left, or increasingly indented, or skittering across the page. The poems appear to pick up speed or to stutter, hesitate, reconsider their direction—an appropriate strategy for Phillips’s thematic concerns—boundaries between nations, between eras, between life and death. December 2017—My essay “Poetics of Bewilderment” is now up on the Ploughshares blog. December 2017—I will judge The Tusculum Review‘s chapbook contest. The deadline for submissions is March 1, 2018, and guidelines are available on their website. December 2017—My poem “The Uncanny Valley” was published by The Offing. Many thanks to the editors for their support of my work. November 2017—My poem “Believe It Or Not I Started To Worry” was published by The Shallow Ends. Many thanks to editor Eloisa Amezcua for giving this poem a home. November 2017—My essay “Repeat After Me” on anaphora, featuring a brief examination of the anaphora’s place in St. Vincent’s new song “Los Ageless,” is now up on the Ploughshares blog. November 2017—My review of Nathan McClain’s poetry collection Scale (Four Way Books, 2017) is now up on the Poets Recommend feature from On the Seawall. Thanks to Ron Slate for including me again in this feature. November 2017—Thank you to the incredible poets who have contributed blurbs to my third poetry collection Empty Clip, forthcoming from the University of Akron Press in spring 2018. November 2017—My interview with poet Ruth Awad about her first poetry collection Set to Music a Wildfire (Southern Indiana Review Press, 2017) is now up on Southern Indiana Review Online. October 2017—The description and time for “The Art of Unlearning in the Creative Writing Workshop,” the panel on which I’m participating at AWP 2018 in Tampa, Florida with Christopher Salerno, Patrick Bizzaro, Hadara Bar-Nadav, and Megan Kaminski, is now available on the conference schedule. September 2017—My poem “‘You Should Write a Poem About That,’ They Say” is now up on The Cincinnati Review‘s website as a part of their online miCRo feature. September 2017—“Generosity as a Social Justice Reading Practice” is now up on the Ploughshares. September 2017—My essay “Excisions,” published in StoryQuarterly, was named a Notable Essay of 2017 in Best American Essays 2017. September 2017—Check out my review of Morgan Parker’s There Are More Beautiful Things Than Beyoncé over at the Boston Review. 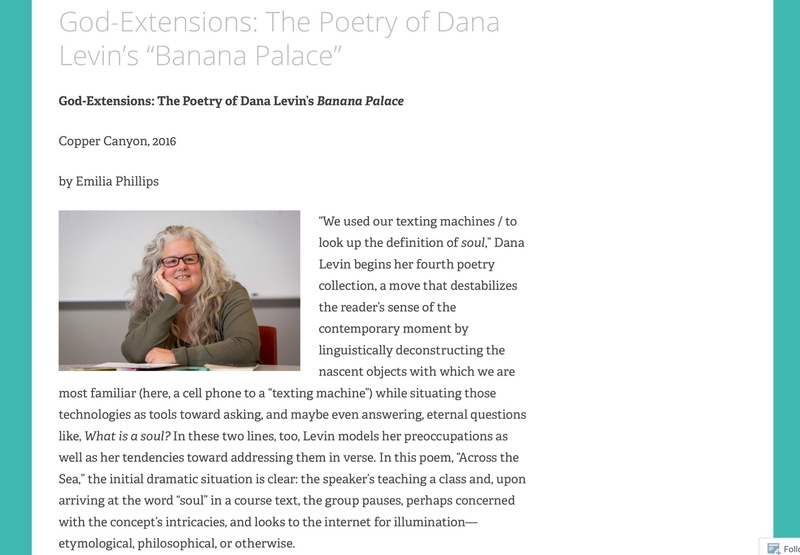 September 2017—Check out my new review of Dana Levin’s Banana Palace (Copper Canyon, 2016) up on Poetry International. August 2017—There are still slots in my two upcoming, online courses through 24PearlStreet from the Fine Arts Works Center of Provincetown: “This Last, Selfish Stitch: On Empathy, Appropriation, and Writing About the Body” (9/18–10/13) and “The Upside-Down: Contemporary Pastorals and Necropastorals” (10/23–11/17, note the overlap with Halloween). For more information about these workshops and other upcoming events, check out my Events page. August 2017—My third poetry collection, Empty Clip, will be published by the University of Akron Press in Spring 2018, with cover art by Rhed Fawell. Many thanks to my editor Mary Biddinger and designer Amy Freels for all of their work toward making my manuscript a book. August 2017—Thanks to The Adroit Journal and Demetri Raftopoulos for interviewing me about Groundspeed, illness, and lyrical essays in issue twenty-two. August 2017—”Sweat of Thy Face,” personal essay about being accused of witchcraft in the ninth grade appears on Passages North‘s online content. August 2017—Thanks so much to Foundry Journal for asking me five questions for their website. July 2017—My poem “Pathetic Fallacy” is the Poem-a-Day from the Academy of American Poets. Thanks to Alex Dimitrov for publishing it! July 2017—My review of one of my favorite recent books, Anybody (W.W. Norton, 2016) by Ari Banias, is in the new issue of KRO. July 2017—My essay “What Is Poetry?” is now up on the Ploughshares blog. For me, the best definition of poetry is the act and the experience of reading a poem. For every poem I read, I redefine poetry, little by little, so that I’m always, consciously or unconsciously, grappling with what it is and can be. This can happen poem to poem in a single collection, or it may arrive through the serendipitous juxtaposition of a poem I sought out and another that someone gave me. June 2017—Lisa Russ Spaar reviewed Groundspeed alongside a re-examination of Olga Broumas’s Soie Sauvage on the Los Angeles Review of Books. Many thanks to Spaar and the LARB editors for their astonishing attention to my poems. June 2017—Thanks so much to Hannah Cohen for writing about my Ploughshares essay “The Poet and the News” for Platypus Press. June 2017—My essay exploring the authority of removed poets on the violence afflicting others is now on the Ploughshares blog. June 2017—Thanks to editor Patty Paine for providing me with the opportunity to review Paisley Rekdal’s Imaginary Vessels for Diode. May 2017—The Department of English at the University of North Carolina at Greensboro has spotlighted their four incoming professors, including me. I will join the faculty of their MFA Writing Program this fall. I’m beyond excited about my new job, students, and colleagues. April 2017—“Serious Subjects” considers whether poetry needs to be serious and asks, What is “serious” subject matter anyway? All of my attempted love poems sound like elegies, and so I’ve given up trying to write them for my beloved, lest I give the wrong impression. Occasionally, however, one will come to me like a windfall, a speck of gold in the pan. Like the plastic baby in the King Cake—nearly breaking my teeth. These accidental love poems start elsewhere, among minutiae, my humblest attentions. March 2017—My little essay about eccentric young men who think they deserve attention and expect others to absorb their abuses is now up on The RS 500 as a response to The Mothers of Invention’s Freak Out! album. Thanks so much to editor Brad Efford for always having me on The RS 500 bandwagon! Being deep is often so shallow. I want to call out our darling boys. I want to say you’re so unique you’re nothing special. February 2017—My poems “Self-Portrait Without a Body” and “Pica of Unsaid Things” are in the new issue of Foundry. Many thanks to Elizabeth Onusko for giving this work a home. February 2017—My poem “Barista,” inspired by the form of Laura Kasischke’s “Hostess,” is now up on Banango Street. February 2017—Thanks to editors Rebecca Hazelton and Alan Michael Parker for including my poetics manifesto in the new anthology The Manifesto Project, now available from The University of Akron Press. February 2017—My new little essay “Earing the Clink of Chisels: An Imperfect Love Letter to Reading Literary Magazines” begins with my experience of reading 1918 issues of The Little Review at the Philadelphia Museum of Art Library & Archives (thanks, Susie Anderson!) but then becomes something of a meditation on reading lit. mags in general. Check it out over on Ploughshares. February 2017—In Fall 2017, I will join the MFA Writing Program at the University of North Carolina at Greensboro as an Assistant Professor of Poetry. I’m thrilled about the opportunity, and I will be posting more about the transition here on the News page and at my blog, Ears Roaring with Many Things. February 2017—”A List for Mentors” appears in the new print issue of TAB: A Journal of Poetry and Poetics alongside my AWP Writer2Writer mentee Ann V. DeVilbiss’s poem and other program participants. January 2017—My review of Solmaz Sharif’s poetry collection Look is now up in the 10th Anniversary Issue of Diode. Thank you to editor Patty Paine for publishing the review. Buy Look directly from Graywolf Press here. January 2017—“White-Out Conditions: Poetic Page, Scale, and Scope,” my latest Ploughshares essay, explores poetic scale and scope, form and format, composition mediums, Dana Levin’s Banana Palace, and more! January 2017—Thanks to the editors of The Collapsar for including my poem “Age of Beauty,” a Poem-a-Day from the Academy of American Poets, on their list of favorite reads this week! January 2017—Thanks to Alex Dimitrov for including my poem “Age of Beauty” on Poem-a-Day from the Academy of American Poets. January 2017—Thanks to poetry editor Shane McCrae for including my poem “This is how I came to know how to,” from my third manuscript Empty Clip, in the new issue of BOAAT.